I went to a dermatologist this evening and was diagnosed with urticaria hives or dermographism. The itching and hives began only five days ago and I'm happy to have an answer but not very happy to hear that so many others have suffered for so long. I am 43 and engaged to a man with whom I live. We normally have "relations" on a very regular basis, but I don't think that we've had them since the discomfort began. Along with the itching and subsequent hives, I have also suffered from severe heartburn. The dermatologist did not mention heartburn as being one of the urticaria hives symptoms, but it began the day after the itching. The doctor is starting me out taking Hydroxyzine (25 mg) four times a day. In addition, I am taking Zantac150 for the heartburn twice a day. I am separately being treated for migraines, which I have suffered for more than 10 years. In addition, constipation has been a reoccurring issue for me. I try to eat a lot of fibre to keep it under control and drink a glass of Citrucel each day. I had back surgery two years ago and have some nerve damage that sends some pain down my right leg. It may sound like I have several issues, but I am thankful and hopeful that the Hydroxyzine will help with as few side effects as possible. The doctor wants me to call him in 3 days and see him again in 10 days. If the Hydroxyzine does not work well, he wants me to switch to Prednisone (10 mg) 2 tablets each day. He also recommended that I put baking soda in my bath water and use Sarna lotion all over when I get out of the tub. Its active ingredients are Camphor 0.5% and Menthol 0.5% and they may help with the pain/itch. He said that I should not scratch, which is easier said than done, but I'm going to try my best not to scratch. I recently went to a specialist for the migraines, who has eliminated a lot of items from my diet. I almost have to wonder if the stress of the change of diet somehow brought out the urticaria hives or dermographism. Also, I recently was exposed to latex condoms, which I suspect may have triggered the initial itching. The doctor told me that this condition may have been in me for a long time and now something has triggered it to come out. Now that it has come out, my skin is sensitive to many things that it was not sensitive to prior to this week. I have always worn make up, gel nails, hair spray, deodorant, perfume, etc. with no problems. Now...I'm concerned. Another thought that I will share is that my fiancée and I were discussing some pretty serious "future" stuff, which made me quite emotional on Sunday evening. 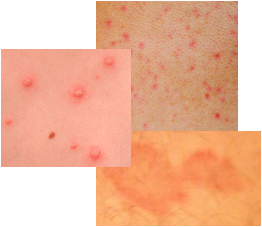 I wonder if that emotional outbreak had something to do with this urticaria hives condition surfacing. It's only day 1 (diagnosed) for me and day 5 of suffering, so I'll write back with any future developments. I think having a positive attitude has to help. Thank you to all who have posted their urticaria hives treatments and stories. It is a great way to compare notes. I have had the dermographism urticaria hives condition since I was about 7 to 8 years old, and I did not find out about the actual name of it until I was 15. I am now 16 and I still get it occasionally, but doing little things, like wearing clean clothes everyday, keeping away from dust, and trying not to get heaps of friction when I do my intense sports training. However, I must say that it is extremely hard during training. My face gets as red as a tomato some days and when I used to go to school, I had to do oral presentations in front of the class. I would get nervous and the abnormal redness on my face was just a laughable joke to the class. It is still really hard to cope with because sometimes, depending on the weather, my lips get as red as if I am wearing lipstick. It is really embarrassing and many people judge me on it. Also, when I was little, I went to a swimming class and accidentally fell into the pool back first. The friction of the water caused my back to look like someone belted me. Child services came banging on my family's door step that night and kept accusing my parents of abusing me. Luckily when they checked me out, there were no marks, because the urticaria hives only last 15 to 30 minutes, sometimes a little longer. By the time they woke me up, the redness and all the skin marks were gone. Luckily, they did not have the evidence to do anything or who knows where I would have be today. I have not tried any medications for the urticaria hives or dermatographism. I am just taking it one day at a time and if it happens, I just explain that it's my skin condition, and it's harmless, not contagious, and nothing to worry about, etc. However, it is upsetting that there are heaps of judgmental people out there in the world. Girls have laughed at me because of this hives condition that I have. They think I am a freak and it was a major cause of being bullied at school. My advice to people out there with this urticaria hives condition is to not let it get you down. Be proud that it does not kill you, or shorten your life, and also be proud of the fact that you can do something amazing, and that is write on your skin! Forgot a pen? No worries. Use the tip of your finger nail to write on your skin. Do not worry too much about the hives appearing because by the time the word gets out about this skin condition, it will be less embarrassing because people will be aware of it and not be so freaked out about it all. Anyway, I hope this has helped you and don't let it get you down too much. Just live life and ignore the people who judge you on something that they do not fully understand. They should be judging you on your personality and not the redness and welts on your skin. Stay well and keep me in the loop of your progress. I have had this urticaria hives problem ever since I was little. When I got older this skin condition got much better. I still have it, but it is not so bad now. I am 18 and I remember having this ever since I was 6 years old. I remember my back being the most problematic for me. I used to hate wearing shorts or not having a shirt covering my back, because at times it felt like the air was causing my skin to itch so bad. But thank the Lord I am much better now. I still have the hives rash at times, but overall I am much better.